Albion Records here offer a most interesting collection of small choral pieces by Vaughan Williams. The disc is being released to mark the 60th anniversary of the composer’s death on 26 August 1958. The programme is advertised as a collection of recorded premieres, and so it was when the recordings were made. However, I gather that since then the Saint Louis Chamber Choir has pipped William Vann’s choir to the post with a recording of O Praise the Lord of Heaven for Regent Records. The result is that Albion here present a “mere” twenty-one recorded premieres. There follow six settings for unaccompanied male voices. The Jolly Ploughboy is a fairly straightforward – but enjoyable - setting made in 1908 of a Sussex tune that VW had collected four years earlier. This group of songs contains one or two surprises, though, and now here’s the first. Who knew that in 1921 VW made a setting of Stephen Foster’s Old Folks at Home, also known as Way down upon the Swanee river? It was news to me. Even more remarkable, though, is the revelation – from the notes – that VW appears to have been inspired to write it by the singing he heard from soldiers in wartime France. The score is inscribed: A recollection of the Harmonies often improvised by members of the BEF [British Expeditionary Force]. So, in its modest way this little song is as much bound up with VW’s wartime service as the ‘Pastoral’ Symphony. The arrangement is sentimental in the best sense of the word. A Farmer’s Boy (1921) is a folksong. The tune is delightfully robust and tells a story with a happy ending – good things come to him who waits. The World It Went Well with Me Then (1934) is another traditional song, possibly dating back as far as the seventeenth century. This song tells a different tale: marry in haste and repent at leisure. I said there were couple of surprises among the numbers for male voices. Here’s another. Tobacco’s but an Indian Weed (1934) is another traditional English tune but it’s the words that surprise. They can be summed up as ‘Smoking can damage your health’. The words are from the seventeenth century and perhaps it’s no surprise to find that in a text written at that period in history smoking should be considered in parallel with man’s sinfulness. I don’t think it’s as memorable a tune as, say, A Farmer’s Boy but the arrangement is interesting. The male voice section of the programme ends with The New Commonwealth (1943). This has an interesting origin in the noble Prelude that VW wrote as part of his incidental music to the 1940 film 49th Parallel. Anyone who has heard the original - for example in Rumon Gamba’s fine recording (review) - will know what a memorable melody this is. VW obviously knew a good thing when he saw it and got the librettist of Hugh the Drover, Harold Child (1869-1945), to write him a set of words for a patriotic song. He then made no less than four different choral arrangements of the song – the mixed voice arrangement is on an earlier Albion disc, Hope is shining (review). The male voice version enables the nobility of the tune to speak freely. Next, we hear a series of choral settings, most of which have organ accompaniment provided by the excellent Hugh Rowlands. The exception is O Praise the Lord of Heaven (1913), which is a cappella. That piece, a setting of Psalm 148, was written for performance by large forces – two SATB choirs and a semi-chorus – in the vast acoustic of St Paul’s Cathedral. Far more modest forces – 20 singers – are deployed on this occasion but, of course, they’re professionals and they make a fine showing. It’s a jolly good piece and I like the way that this excellent performance brings out the differentiation between the sets of voices and also the dynamic range in the music. The latter is demonstrated by the excellently controlled crescendi that feature near the end. My soul, Praise the Lord (1935) is a pretty straightforward affair. It’s a hymn in which the first two verses are sung in unison, the third with a descant and the last verse in four-part harmony. Little Cloister (1935) is also a hymn. The tune was designed to replace the original tune for hymn number 262 in the hymnal Songs of Praise; this had been judged unsatisfactory for some reason. The words are by Percy Dearmer. VW’s new tune is a fine, rolling specimen. I should imagine it’s great to sing once you’ve got the hang of it, although the long lines might give a congregation breathing problems. In the end the tune was not incorporated into Songs of Praise. A Hymn of Freedom (1939) is a hymn which was written in the early months of World War II. It’s a unison tune – apparently, VW was emphatic that it should be so and not SATB. The words are by a Worcester clergyman, Canon George Briggs. The words are somewhat dated but it would be a shame if VW’s stirring and aspirational tune were to be lost without trace. I found I could pick it up as I listened to the CD. VW turned to Canon Briggs again for the words to another wartime hymn, A Call to the Free Nations (1941). This is another wartime morale-booster but VW was able to set the words without any musical jingoism. Rather, his robust unison melody expresses pride and defiance in the face of adversity. England, My England (1941) sets words by W E Henley (1849-1903). These are very much of their time but the rousing music is good to hear and in the third of its four verses the music is chorally more ambitious. In this performance the choir really gets hold of the piece. Incidentally a line in Henley’s poem provides the title for the CD. The Airmen’s Hymn (1942) is another wartime piece, for unison choir with organ – there’s also a descant in the last verse. Here once again VW transcends the words with a stirring tune. Finally in this section, we hear Land of Our Birth. This turns out to be part of the work that VW was commissioned to write in 1943, in anticipation of an eventual Allied victory. As Thanksgiving for Victory, the piece was heard at the end of the war and was subsequently recorded under the revised title of A Song of Thanksgiving. I came to know the complete work through a recording of the first broadcast of the work, conducted by Boult, which was issued by Dutton (review); it’s a worthwhile piece. Land of Our Birth, which has words by Kipling, was published as a separate item in 1946. Here it’s performed in a 1950 version that VW made for unison children’s choir (here the sopranos do the honours) and the optional descant is included. Finally, we hear music with definite Scottish connections. Hymn for St. Margaret of Scotland (1948) was written for inclusion in a new hymnal entitled Hymns for Scotland. Ursula wrote the words, which I think are pretty good. VW wrote a strong, confident tune which, if I may say so, ought to set Scots’ pulses racing. Here the hymn is performed with VW’s unpublished last verse descant. Last of all come the Three Gaelic Songs (1954) for unaccompanied choir. These are sung in English translations by Ursula. The first, ‘Dawn on the Hills’ is a touching little song with a soprano solo, here really well sung, at the start. ‘Come Let Us Gather Cockles’ is jolly and lively while ‘Wake and Rise’ is gently haunting. For me, the best has been saved till last with the inclusion of these three songs. There are no undiscovered masterpieces here, but that’s not the point. The selected pieces may be individually modest but everything here is very enjoyable and throughout the programme we hear example after example of VW’s melodic gift and empathy for voices – as we know, he could write a cracking unison tune; look no further than For all the Saints. Furthermore, the programme offers an abundance of examples of his fine craftsmanship. This collection valuably fills out our knowledge of VW. The cause of the music is admirably served by William Vann and his fine choir. Twenty-three singers are involved and I suspect that most, if not all of them, are professional singers; I noticed a few names familiar to me from recordings by other expert ensembles such as Stile Antico and the Marian Consort. The standard of singing is consistently very high and one thing that pleased me greatly was the choir’s excellent diction. Perhaps most important of all, at all times they engage with the music; the performances are always committed. Vann and his choir have also recorded a disc of VW’s Christmas music for Albion. That will be released shortly after this present album and I look forward to hearing it. Production values are high, too. The sound which producer Andrew Walton and engineer Deborah Spanton have produced is excellent: the choir is always clearly heard and well balanced with the church’s acoustic used intelligently. The organ has been most successfully recorded. All the texts are provided and John Francis has written an excellent and highly informative set of notes. 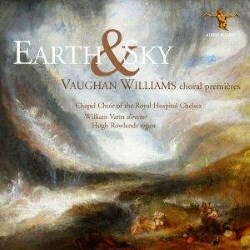 Vaughan Williams enthusiasts should not hesitate.